FAQ: What's the best way to remove chemical taste from a flexible tank? A customer contacted us regarding a collapsible drinking water tank, with a problem he explored. He bought a collapsible flexible tank to store potable drinking water. This customer had a challenging time getting the chemical taste out of the tank. He tried it with white vinegar a couple times and it worked temporarily but then the chemical taste returned. The customer asked our tech team for suggestions to resolve this problem. Washing out the Tank with Hot Water: The first thing our team recommended for cleaning this tank was to wash the tank out with hot water (temperature around 158° F/ 70° C). Mild Chlorine Solution: If the above method does not work in successfully removing the taste inside the tank, you can also try cleaning the tank with a mild chlorine solution (the solution should be no higher than 5%). This chlorine should be used to rinse the interior of the tank to help remove the taste. Sterilizing Agent: As an alternative to the chlorine solution, the tank can also be washed out with an approved sterilizing agent. All of the methods listed above are designed to help clean the interior of your tank. This can help keep the interior clean and sanitized for continued safe storage of drinking water. Anytime you are using a flexible tank for drinking water, the interior of the tank will be constructed with an FDA and NSF 61 approved material that prevents the fabric from causing harm to the drinking water stored within the tank. 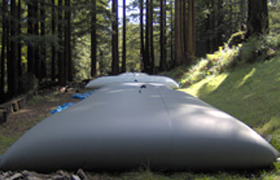 For more information on a pillow tank and tank fabric, please view our Collapsible Drinking Water Tank page.